Special 7 Night Coral Sea Exploratory - Holmes,Bougainville, Osprey and Ribbon Reefs. 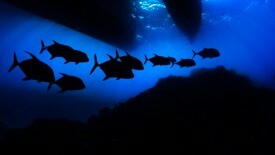 7 Nights – 28 Dives. This action packed 450 mile Coral Sea adventure combines the Holmes; Bougainville and Osprey reefs with superb Ribbon Reef biodiversity. If itinerary A doesn’t proceed, reverts to B. These expeditions are suitable for open water to advanced divers alike. Weather permitting our best selection of Coral Sea dives, at Holmes, Bougainville & Osprey. As the sun sets over the coastal port city of Cairns, you’ll board Mike Ball’s Spoilsport to begin your epic diving adventure. Meet the crew, mingle with guests and settle into your cabin as you cruise overnight to the first stop on your 450 mile dive odyssey. Nonki bommie thrusts to the surface from 35 meters with a big crack in the middle. The canyon in the middle is decorated with golden gorgonian fans plus giant yellow and red sponges. In the distance sharks circle the bommie to complete the recipe for an amazing dive. Pristine white sand slopes up from the depths until cut off by tall bommies that lead to the shallow reef wall patrolled by grey reef and silver tip sharks. The wall is peppered with beautifully arched passageways big enough to fit a small car. Plummeting clear blue waters, giant potato cod. Spectacular big fish action at Crystal Plateau. Explore the Dungeons & Dragons labyrinth of caves & caverns. Dive the scattered remains of MV Antonio Tarabocchia. Sites we will visit: Dungeons & Dragons, Middle Earth and Crystal Plateau. Glide past huge black coral trees, giant feathery soft corals, golden fans and red whips along the plummeting walls. 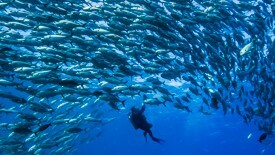 Swim amongst schools of giant trevally, dog-tooth tuna, blue spot trevally, barracuda or bumphead parrotfish. Observe or be observed by the many shark species in the area. 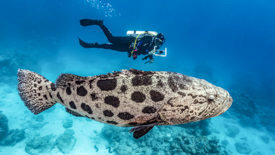 In association with Central Queensland university guests have the rare opportunity to observe, photograph and dive with these deep sea creatures. Exciting shark action in the Coral Sea! Your Osprey Reef adventure builds to a climax with a spectacular shark dive at North Horn. You will see 30-50 grey reef sharks, white-tip reef sharks and silvertips. You can photograph these sleek high order predators at close- range. An amazing phenomenon awaits you at the Cod Hole. This world famous dive site is home to a resident population of friendly, ‘small diver size’ potato cod. Once you’ve taken the obligatory photo, spend the rest of the dive exploring shallow, sunlit coral gardens or cruise over to ‘Shark Alley’. An isolated platform reef shoaling up to form a number of deep coral bommies festooned with multi coloured crinoids. Olive sea snakes are commonly found and are both very curious. It is also common to sight a variety of ray species, cuttlefish and turtles. Steve’s Bommie is one of the Great Barrier Reef’s best and most popular sites. This site is a photographers dream! It’s hard to put into the words the quantity and variety of Great Barrier Reef fish and corals that you will see here. Courtesy transfers are provided from the vessel to the Mike Ball office, inner city hotel locations plus the Cairns Domestic and International Airports.